My youngest grandson called last evening. He was so excited and so am I.
Tyler Williams has achieved a thrill that eluded me when I was his age; his hero has made amends for mine. A few nights ago my son and daughter-in-law took their son, Tyler, to see a production of Shakespeare’s Henry IV starring Tom Hanks. Though he’s only 13 Tyler loves Tom Hanks. He told me he’s been a big fan of Tom Hanks his entire life! Well… since he was three. While looking around before the show a stagehand apparently asked him if he was a Shakespeare fan, or words to that effect, and Tyler said yes, but mostly he’s a Tom Hanks fan. The guy said maybe he could arrange for Tyler to meet Tom Hanks after the show. You can’t imagine how excited my grandson was. Tom Hanks had found him. Tyler was over the moon! They talked for a few minutes. Tyler told his superstar hero that he, too, was an actor. Tom told him to keep practicing and offered some funny suggestions about how to enunciate properly. 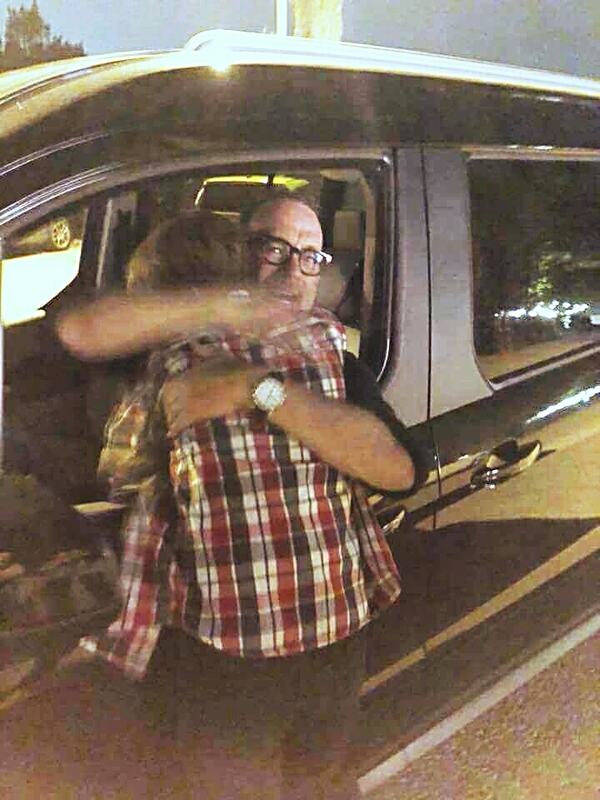 A personal autograph followed and then, a big hug. Tyler will be walking on that cloud his entire life. 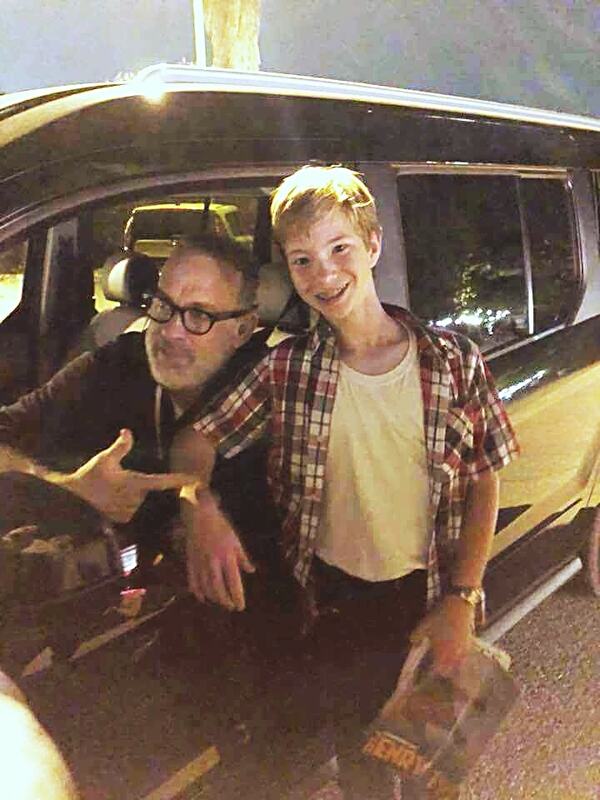 And how much time did it take Tom Hanks to give a kid a thrill and maybe some lifelong inspiration? When I was about Tyler’s age I had a chance to talk to my hero, too. I was the only kid there when Willie Mays left the San Francisco Giants clubhouse following a game. I looked at him as if he was a god. But he didn’t look at me, not even a glance. He ignored me as if I didn’t exist. Without breaking stride he walked straight to his car. It took me a lot of years to forgive Willie for my crushing disappointment. As I got older I did forgive him but I never forgot the pain of thinking my hero was not a nice man. It shattered my feelings for him. But now, more than 50 years later Tom Hanks has made up for it. I guess you could argue that I learned a valuable lesson that day so many years ago. Maybe. All I know is it hurt real bad and some of that stayed with me for decades. Tyler will never feel that way. God bless you, Tom Hanks. Above is the program that Tom Hanks autographed for Tyler. Kinda hard to read here. 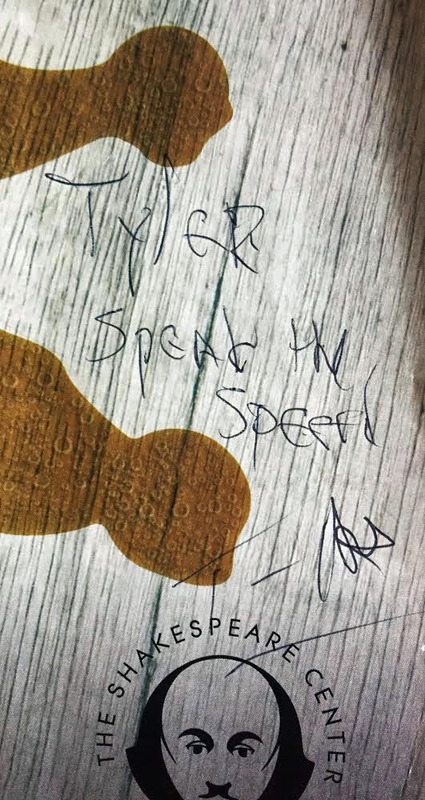 It says, “Tyler, speak the speech. – T. Hanks” It’s a line from Hamlet in which Shakespeare tells actors to speak as real people do, not with florid exagerration as actors frequently do, especially while reciting his works. That’s my interpretation, at least. It is an amazing gift from a wonderful actor to a greatful young fan. I have an office in our home that was originally a guest room. After we’d lived here for a couple of years it had only hosted two guests so CarolAnn decided I should put it to daily use. If anyone else comes to visit we’ll cross that bridge. My room has family pictures on the walls and one very special photo in its original 67-year-old cardboard frame parked weirdly in a desk paper organizer. We’ll get a frame for it sooner or later. 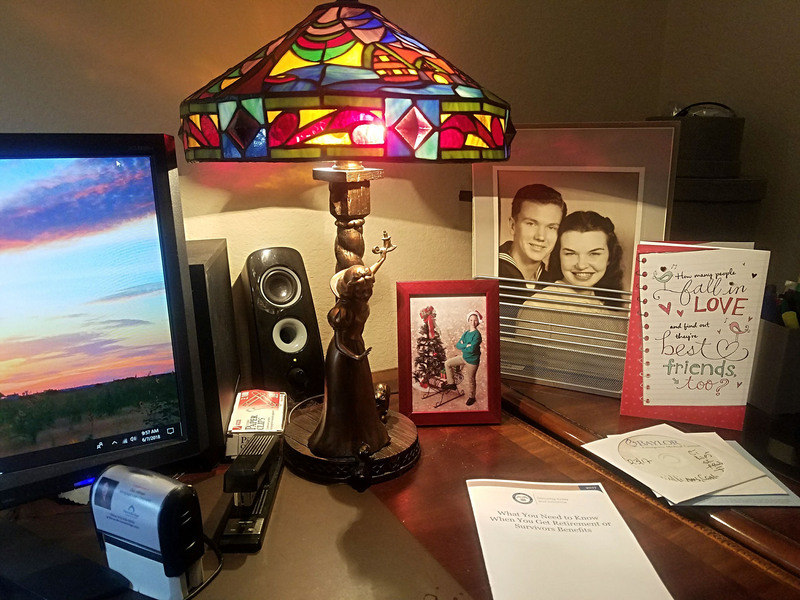 For now I get a warm, secure feeling from having my dad and mom smiling at me as I sit at my computer still trying to make something of my future. They’d like that future planning, even at my age. They taught it to me. 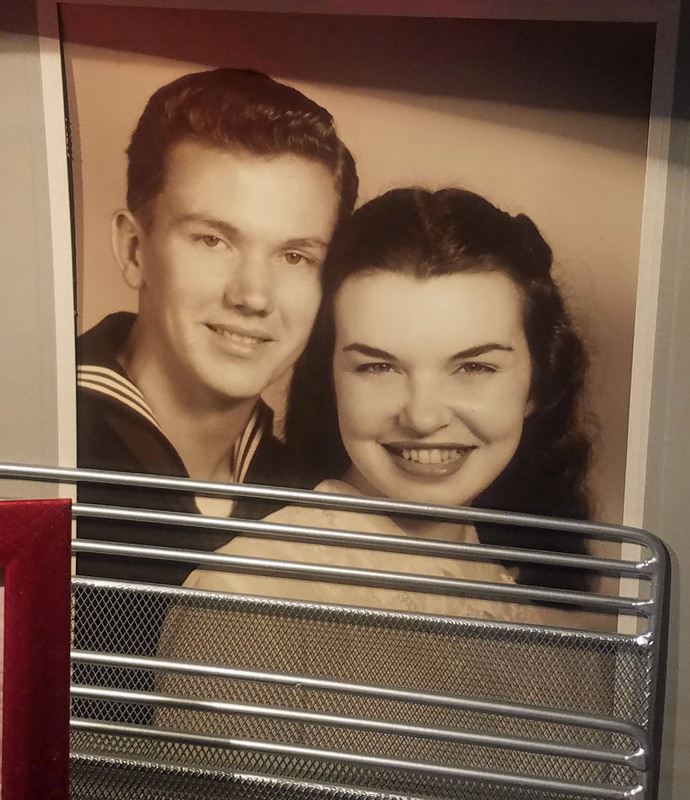 It’s their wedding picture, taken August 6, 1950. I was born exactly one year later. As a young child unacquainted with the social implications of the times I always proudly told people I was born the same day they got married. 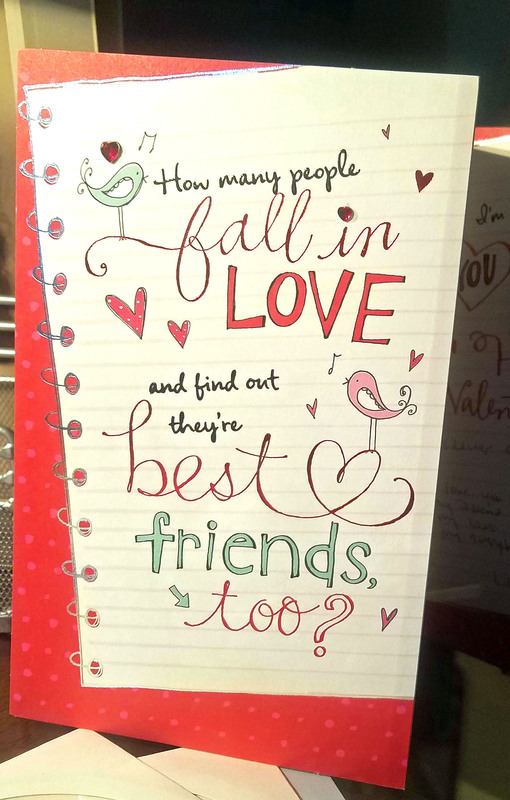 The Valentine’s Day card is from my CarolAnn from this past February as we started our 30th year together. It’s one of those just-perfect cards that seems like it was written specifically for the two of us. It allows me to be with her even when I’m alone in my room. 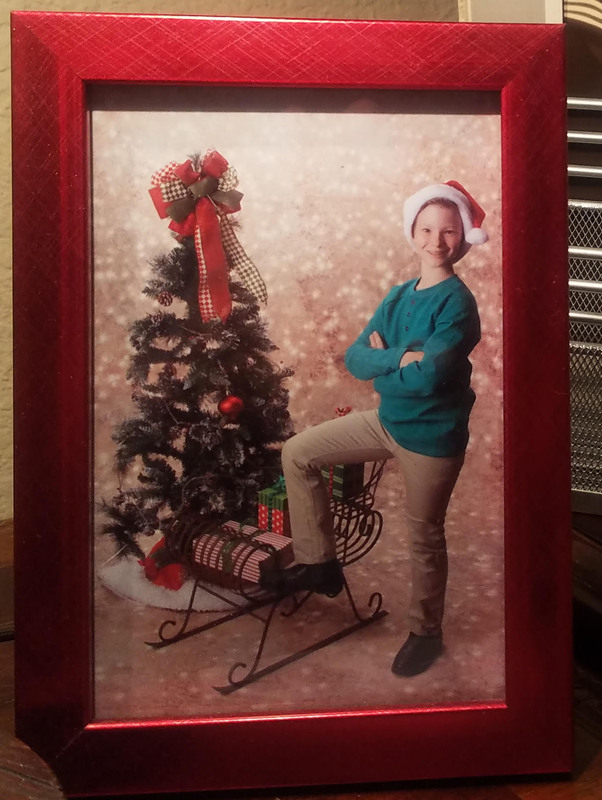 The smaller photo is our youngest grandson Tyler in a Christmas pose from a couple of years ago. He reminds me of why I want to keep learning and growing. Oh, and the Snow White lamp? It used to reside in our Disney themed room in Southern California. We don’t have one of those here so it stays with me. I love the warm light, the bright colors and the constant reminder that we’ve invested a good portion of our time and fortune to the Disney Corporation. We feel it has been time and money well spent. I love our home, every bit of it, but this is my favorite corner. It’s a snapshot of a small piece of my happy life. I’d like to say my family always looked this happy but that wouldn’t be true. It wouldn’t be true of any family. Old photos allow us to keep and embellish the good times when everyone was smiling because we were all really happy together, at least in that moment. My old pictures invoke a nice warm feeling of a time when life was less complicated and when my family was together for everything including mealtimes at the table, visits with our relatives and family vacations. 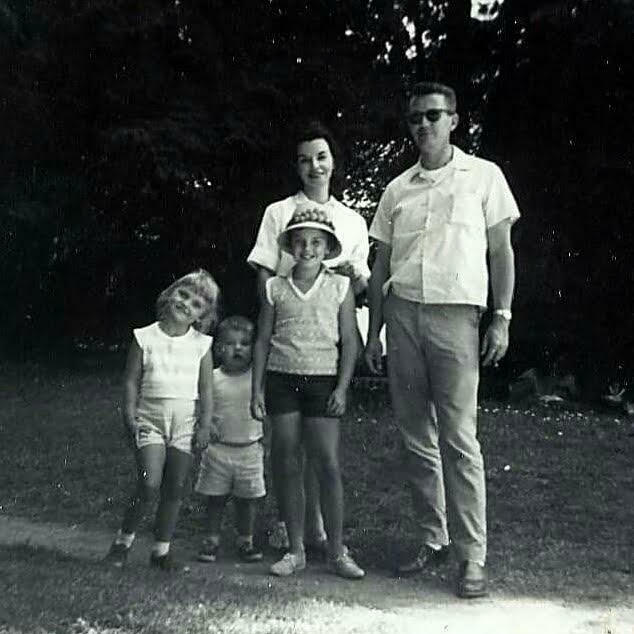 This was our family vacation in McCann, Northern California, along the Eel River in August of 1964. We were there for a week which included my 13th birthday. My parents gave me a stamp collecting album and a wonderful variety pack of international postage stamps to study, sort and paste. I also got a new, official National League baseball which my dad and I tossed back and forth for hours that week right in the middle of the dirt road outside our cabin’s front door. McCann was already a ghost town when we were there. It was smack dab in the middle of no place, Humboldt County. It had been a stage coach station in 1881 and a post office soon after. It tried to be a town but stumbled and failed in the thirties and forties. By the time we got there in ’64 there were no living businesses, just the dirty old windows of store fronts that had been abandoned decades earlier. As I remember it we were there for an entire week without seeing another soul. The only traffic we saw and heard were the Northwestern Pacific freight trains that rumbled and shrieked just a few feet past our cabin in the middle of each night. When that happened we all woke up and giggled in the dark, not just us kids, our parents too. We had no TV in that cabin and couldn’t even get a radio signal. I know because I tried. Instead we just played together. We hiked down a steep river bank to get to the water’s edge. I held my little brother’s hand as we waded into the Eel. I held onto the blowup raft with my little sister aboard and grinning from ear to ear. Dad and I fished with salmon eggs for bait and I saw beavers playing in the water not far from the lodge they had built from the branches of young fir and redwood trees along the shore. My mom burned my birthday cake trying to bake it in an ancient wood burning oven in the cabin. It was edible, just toasty, and I loved it because it was mine and Mom made it for me. On my birthday I wrote a note to the future, shoved it into an empty tin can and stuck it deep inside a hollowed chunk of a tree that was still very much alive. I imagined that the tree would grow over that hole and preserve my message. Someday, I thought, someone would cut that tree down and find my hello from the past. Wouldn’t it be something if it was found now, in the 21st century? I remember all of that from one picture taken 55 years ago. I probably have a lot of it wrong. I just remember it as I wish to. I’d like you both to know that though I don’t get to be with you very often I think of you every single day. I really do. When I wake up in the morning my first thought is to be grateful for a new day. I thank God for it. If you don’t believe in God that’s your right but you should give it some serious thought before you dismiss the possibility that you are alive for a good reason, not just by accident. Either way, you should start each day happy to be alive. Be grateful for sunrise, blue skies, cold rain and for puppies and bugs. Be grateful for the people you love. That’s when I think of you, first thing each day. When you’re happy it makes everyone around you happy. It’s contagious. They spread their happiness to other people. We need more happy people in the world. As you get older you will learn a great many things about life. You’ll learn most of them from experience but you can get a lot of good tips from your parents, grandparents and other people who are older and carry your life in their hearts. I’d like to share some of my life lessons with you. I’ll just do one at a time. If you can’t love yourself, who will? I’ll have some more of these from time to time. You can take them to heart or just consider them and decide later what you think. We never know how much time we have left so I’ll give you the end of these lessons here and now. Copyright 2018, David L. Williams. All rights reserved. The nice thing about growing older is growing wiser, of course, but sometimes we’re disappointed to learn that our epiphanies are not original. When I had that revelation I figured I was a genius. I thought it belonged in a book of quotations! Every time I have thunk a great thought I soon learned that many other people with brains mightier than mine had the same thought long before me and they usually phrased it better. “The more you know, the more you know you don’t know.” – Aristotle, 350 B.C. 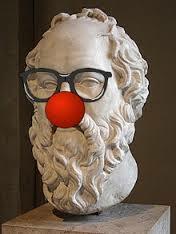 Socrates, who taught Plato who taught Aristotle. See how this works? I still think we should take credit for our great thoughts. When an idea first occurs to us it marks our arrival at a new mile post in our life’s journey. That’s significant no matter who arrived there first. 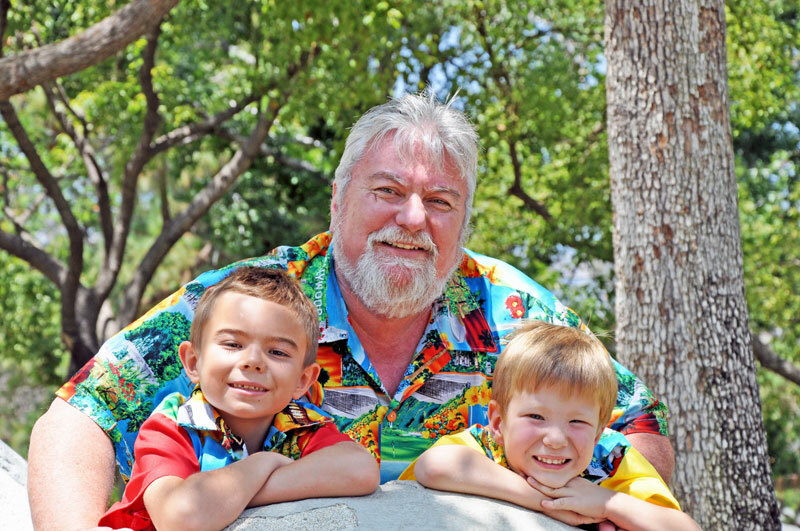 I’ve decided to honor my special friends and family members by noting the wise things they’ve told me that made a lasting impression, regardless of whether it was original to them or whether they heard or read it somewhere. We are, after all, a combination of our life experiences and all the people we’ve loved and admired along the way. 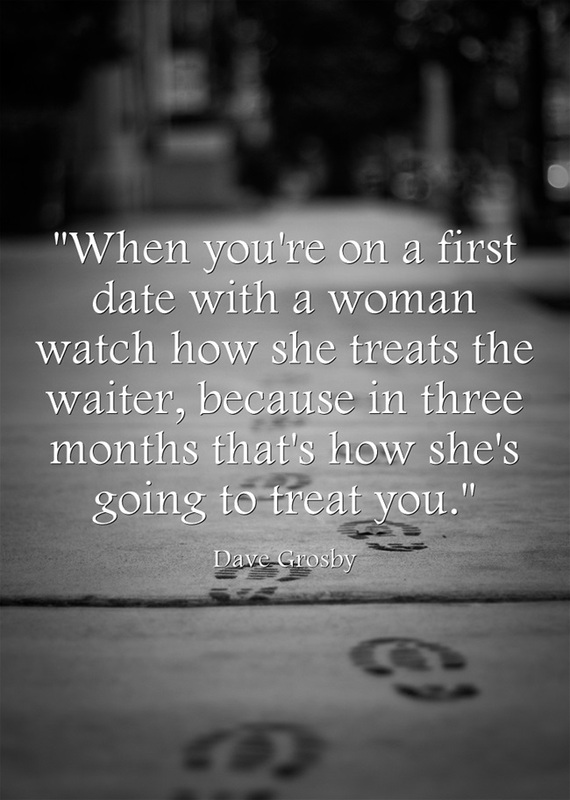 In that spirit I will start here, with my dear friend and former colleague, Dave Grosby, who told me this when we were both young and single, shortly after my divorce in 1981. I don’t remember where we were when Groz said this to me. I’m sure we were drinking hard and laughing our asses off. That’s how we rolled in the early 1980s. But you know what? I never forgot it and it did guide me through seven years of my life as a newly single man. Eventually this sage advice led me to Carolann, the love of my life, who treats waiters, babies and stray dogs with the same respect and dignity she still gives me.